Know your common fly species, the diseases they transmit, and ways to deter them from your property. Flies are a bane to barn life; they not only transmit disease but also irritate horses (and us). Before we dive into control methods, let’s review fly species you might face. Identifying them can help you create an effective fly control plan. The housefly, Musca domestica, and the face fly, Musca autumnalis, are nonbiting flies that feed on eye secretions, nasal discharge, wounds, manure, and on moisture around genitalia. The stable fly, Stomoxys calcitrans, is a biting fly that uses a piercing mouthpart to feed on blood and tends to target horses’ lower limbs and abdomens. The horn fly, Haematoba irritans, is a biting fly that generally feeds on cattle but will bite horses housed nearby. Houseflies and stable flies typically reproduce in manure, wet straw bedding, garbage, and poorly composted manure. Face flies and horn flies only breed in fresh cattle manure. Adult face flies do not like to feed in dark barns or shady areas. The housefly is commonly found in hot summer months; the face fly and stable fly are usually seen from mid-spring to summer and sometimes into early fall. Houseflies and stable flies breed year-round in tropical and subtropical regions, but they hibernate in temperate regions during colder weather. Tabanids such as horseflies and deerflies generally prefer sunshine and avoid shaded places; they are inactive at night. Culicoides species are biting gnats that breed near water. Their preferred biting sites vary; some feed near the mane and tail, while others prefer the abdomen, legs, or face. They are weak fliers, don’t travel far, and are most active at sunset. Summer sores Houseflies, face flies, and stable flies transfer parasitic nematode larvae (e.g., Habronema species) to moist areas around the eyes, nostrils, mouth, genitalia, and wounds. The larvae can’t complete their life cycle in these tissues and incite a hypersensitivity reaction, resulting in chronic nonhealing wounds. Eyeworms Face flies transmit Thelazia lacrymalis, a nematode worm that resides in eye glands and ducts, resulting in irritation and secondary infection. Pigeon fever Houseflies, stable flies, and horn flies can spread the bacterium Corynebacterium pseudotuberculosis, the causative agent of pigeon fever. Infection most commonly leads to external abscesses, though some horses develop more serious forms including internal abscesses and ulcerative lymphangitis (infection of the limb). 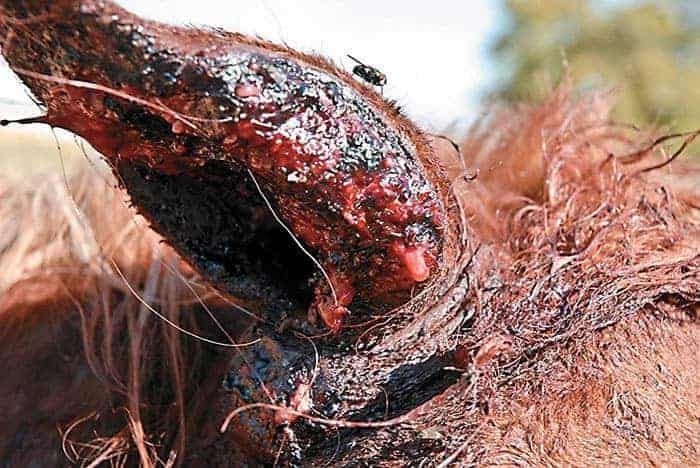 Equine infectious anemia virus Horseflies and deerflies use their large piercing mouth parts to transmit this often-fatal virus from one horse to another. Hypersensitivity Biting flies and gnats can induce hives, intense itching, hair loss, skin thickening, excoriations (abrasions), and skin ulceration that can predispose to secondary skin infection. Onchocerciasis Culicoides species are the intermediate host for the nematode parasite Onchocerca cervicalis. The immature forms (microfilariae) of this worm are found in horses’ skin (often at the midline of the abdomen); adults reside in the nuchal ligament of the neck. The microfilariae cause skin irritation that results in scales, crusts, ulceration, hair loss, and skin pigmentation loss. Quickly remove manure, excess feed, wet straw/hay, and other organic debris. Close garbage containers tightly, and clean them regularly. Locate manure sites as far from stables as possible, or move them off property. Flies can travel miles to find your horse. Move round bales regularly, and clean the feeding area. Modify paddocks, stalls, and watering systems to avoid water accumulation. Cover composted manure with a fly barrier such as plastic. Spread manure thinly on nongrazing pastures to facilitate rapid drying. Place fly spray systems in the barn and apply insecticides (pyrethrin, permethrin) to surfaces where flies rest. Place fly traps (insecticide baits, pheromone lure, or sugar lure) or resin “ribbons” outside the barn to lure flies away from horses. Release fly predators. These wasps lay their eggs in fly pupae, then kill the developing fly larvae. Insecticides will adversely affect fly parasites and should be applied away from where they have been released. Feed insect growth regulators to horses daily or every other day. Treat all horses on the property for maximum efficacy. 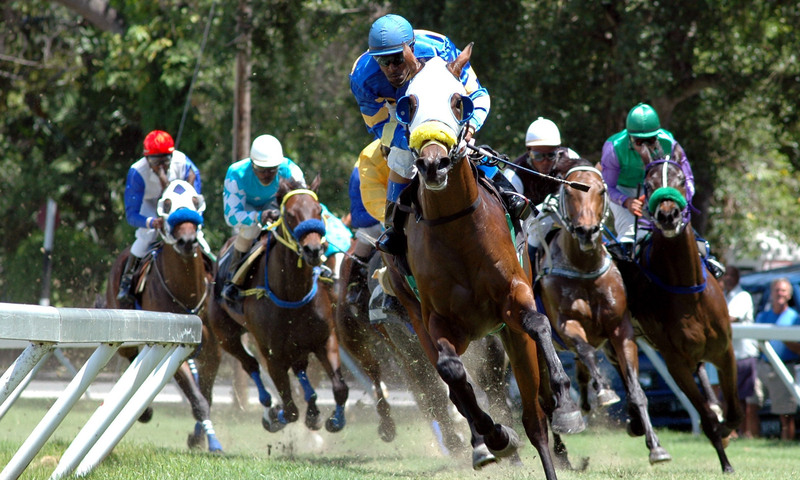 Use horse protection, such as fly masks, sheets, and boots; strong fans; and fly repellent sprays and spot-on treatments. Contact your local extension agent for further information on insect control.